She wants to put an end to the Testing In a scarred and brutal future, The United Commonwealth teeters on the brink of all-out civil war. The rebel resistance plots against a government that rules with cruelty and cunning. Gifted student and Testing survivor, Cia Vale, vows to fight. But she can't do it alone. This is the chance to lead that Cia has trained for - but who will follow? Plunging through layers of danger and deception, Cia must risk the lives of those she loves--and gamble on the loyalty of her lethal classmates. Who can Cia trust? 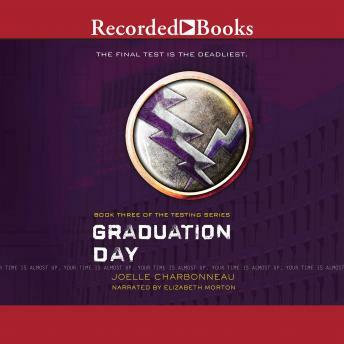 The stakes are higher than ever-- lives of promise cut short or fulfilled; a future ruled by fear or hope--in the electrifying conclusion to Joelle Charbonneau's epic Testing trilogy. Ready or notit' s Graduation Day. The Final Test is the Deadliest!